At one point or another, we have all suffered from menu confusion: the feeling when a restaurant offers too many good-looking dishes, overwhelming us with choice. You don't want to choose the wrong thing and be stuck with it, but you need to make a decision. Bangalore-based startup dishq is using AI and consumer data to try and simplify the process by giving companies like restaurants, office cafeterias, and food delivery services the power to make personalized food recommendations to their customers. 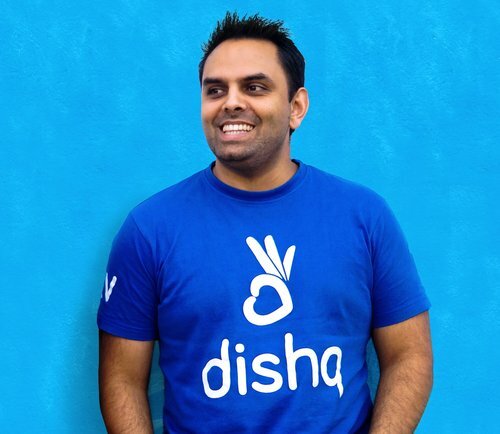 In preparation for SKS Europe this June in Dublin, we decided to ask dishq co-founder and CEO Kishan Vasani a few questions about how his company is trying to simplify the food decision-making process. Q: First off, tell us a little bit about dishq: how does it work, and who does it aim to serve? A: dishq is essentially a taste prediction tech company. Our mission is know what consumers want to eat before they do! We use food science, rich food data, behavioural analysis and AI to achieve this. Our first product is a food recommendation engine, that can be integrated by any digital food business, e.g .UberEats, or by restaurants that use in-store tech, e.g. self-serve McDonalds kiosks. Our technology brings data intelligence into the food decision making process, with inspired and delightful recommendations. Q: What inspired you to start dishq? A: Two things. Firstly, I personally feel the pain of over choice and irrelevance on menus every time I go out to eat or order delivery. One time I went to a restaurant with a 27-page menu! Who wants to read a book when they’re hungry?! I asked the waiter for a suggestion and he gave me what seemed like a generic response, mostly likely what was popular at that restaurant. In the end, I gave up and just asked the waiter to order whichever starter and main. Secondly, having spent 3.5 years at Just Eat, the world’s largest online food ordering platform, I saw how we were collecting useful data on customers, i.e. purchase and browsing histories, but weren’t doing anything with it. When I looked at other verticals, e.g. fashion, music, ecommerce, many of the market leaders in those sectors were considered innovators in personalisation and recommendation. The irony is that food is the most personal and frequent purchase we make, yet the food industry, even today, does almost nothing to help you make the right choice for you. Q: As of now, it seems like dishq chiefly works with food ordering platforms and restaurants. Do you see yourselves expanding to partner with CPG brands in the future? A: The CPG sector is very much a part of our long term strategy. We’re currently developing a data analytics platform that CPG brands can use to better understand the taste profiles of their customers, as well as local and global taste trends in near real-time. We believe this platform will become a critical cog in the new product development process, not just for CPG brands, but also larger restaurant chains who are constantly evolving their menus. We’ll be launching our beta product (for restaurant chains) in late September 2018, with the CPG beta following in Q1 2019. Q: You’ve said that collaborative filtering, like the kind used by Amazon or Netflix, won’t work for food recommendations since eating is such a personal experience. How do you at dishq overcome that hurdle to create personalized recommendations? A: To be clear, it’s not that collaborative filtering won’t work, it just won’t perform as well as a content based filtering (or hybrid) approach. Unlike music recommendations, the stakes with food are much higher. If you don’t like the song that Spotify recommends, you can just hit ‘next’. But the wrong food recommendation comes with both economic and emotional downside. We all know how it feels to have a dish or meal that just wasn’t satisfying. Also, the nature of collaborative filtering means that if a new dish is added to a menu, this type of algorithm won’t be able to recommend this dish because it has no user related history or sentiment to interpret. That’s not the case with a content based filtering approach. However, collaborative filtering does have a limited role to play; it can be used to cluster groups of diners who have very similar tastes. Q: Predictive ordering seems like it might be around the corner—do you see that being a part of the near future? A: Yes, but food platforms need to build trust with users first, especially in regards to their predictive capabilities. Having said that, the element of serendipity is very important here. Being able to continually surprise and delight eaters can really build intrinsic brand loyalty. Nutrition/diet goals are automatically taken care of as machines keep track of your food journey. Never feel hungry, as machines knows your biological needs & cycles. Always eat great food at any place and occasion. They can manage their inventory better and also minimise waste. They can gain loyal customers and hence earn higher revenue per customer. Restaurants need not be dependent upon rating and review platforms any more if there is better alignment between food and eaters. Q: dishq is currently based in Bangalore. Do you work with a lot of customers in India? If so, how does that experience differ from customers you might have in London or other European areas? Are there different needs? A: Our recommendation engine has been available for about 6 months and we have more than 10 company customers, half of which are outside India. We have customers in the US, UK, France, and Singapore. Every customer, regardless of their location, has their own requirements. We’ve found that each one has a slightly different pain point or strategic focus. For some, adding personalised recommendations to their platform is about giving their customers a superior experience, building trust and loyalty. For others, the need is more commercial, i.e. they would like to see their customers spend more. It’s also really important for us to understand the local nuances of food. For example, we have a dual lens for every cuisine. In Italy, there’s no such thing as Italian food; dishes are Sicilian or Tuscan, for example. Of course, for the majority of us outside of Italy, it is all simply grouped under "Italian food." Therefore, our technology considers the relative importance of an individual’s home cuisine. We also know that many popular dishes are cooked in several different and distinct ways depending upon the origin of the chef. Take India for example, one of the most popular local dishes is paneer butter masala, and we understand how it might taste more buttery if it’s made by a chef from the western state of Gujarat or spicier if the chef is from the southern state of Andhra Pradesh. Q: What’s next for dishq? How do you see it growing over the next 5, 10, and 20 years? A: In the next few months, we’ll be launching the first version of our taste analytics platform, which is specifically for digital food businesses. Over the next 18 months, we’ll open the platform to both bricks & mortar restaurant chains, and finally CPG brands. In a parallel stream of work, we’re expanding our recommendation technology to table booking platforms, offering them personalised restaurant recommendations. The longer term plans for dishq are about inserting our technology where F&B businesses and consumers have to make choices. Either a choice about what to eat or deciding what to produce. Our technology is about bringing greater alignment in this industry, thereby increasing efficiency and satisfaction. Our most ambitious plans are to be the platform that holds all the world’s taste preferences, which means we can help businesses instantly identify and personalise their offering to someone, even a new customer. Q: What do I want for dinner tonight? A: How about sauteed sea snails to start, and fettuccine with white truffle butter and mushrooms for as your main. Were we close? If you want to hear Kishan Vasani speak more about how AI and predictive ordering will shape our eating patterns, make sure to get your tickets for SKSEurope in Dublin June 11-12th.